One of the great things about going to wargames shows is looking at some of the games and getting inspiration from some beautiful painting and modelling. 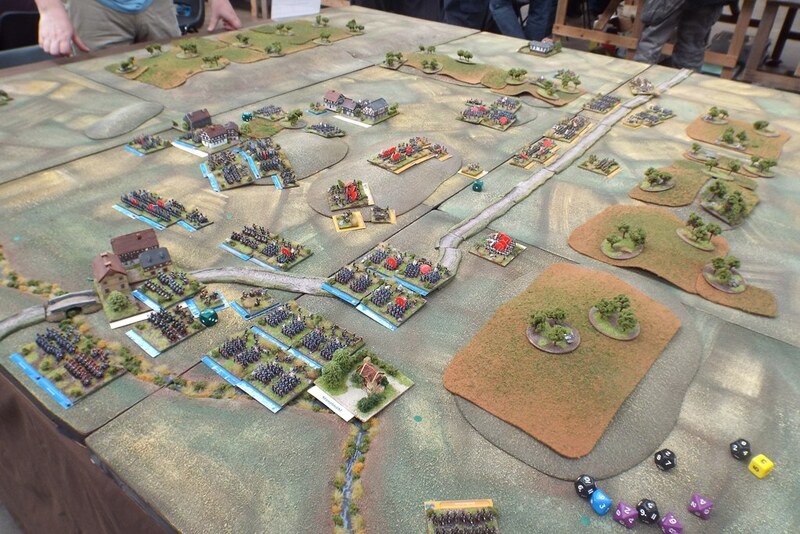 Ever since my usual wargaming opponent, Dave Luff, first saw Steve Jones’ 6mm Napoleonic armies on 60mm x 60mm bases, he has been a convert to this way of representing units. Steve has done a fantastic job with these troops – they aren’t just based, they tell a story. Simply by adding a few more details, and arranging figures slightly differently, he comes up with an end result which looks stunning. The result : a truly beautiful looking battlefield. You can find out more about Steve’s collection on his blog: Steve’s Paintingshed – it’s well worth a visit. If I won the lottery I’d get a load of 6mm Napoleonics like this.